This past Holy Thursday, we all watched as our new Pope, Francis went to celebrate the Feast of the Lord’s Supper at a prison in Rome. If that was not enough to get our attention he then, in the very special part of that liturgy went on to wash the feet of twelve people in remembrance of our Lord washing the disciples feet. The problem, for some, was that besides not celebrating this holy and special Mass in the normal place he was washing the feet of prisoners, women even Moslems. What on earth was Pope Francis thinking? The Feast of the Body and Blood of Christ is rooted in the Mass of the Lord’s Supper. It is a time that we can renew our faith in the Real Presence of Christ, in the Blessed Sacrament. It is a time when we can renew our faith that tells us when we receive Holy Communion that the Sacred Host, the Sacred Cup share with us Christ’s true Body & Blood as He stated so clearly in the Gospel (John 6). Sadly, this most Real Presence and Blessed Sacrament is veiled for many. Pope Francis was showing us it is time to remove the veil. The need for holy veils is important. We all, like Moses are not yet able to fully look upon the awesome beauty, grandeur and love of God’s Presence. Our Lord , in His mercy veils us and yet reveals to us, as we allow, the promise of His Presence. We need to grow in the mercy, redemption and holy love of God to be able to grow in our ability to see and know God. But we cannot allow these holy veils to be replaced by the veils of the world. There is so much God wants to share with us. Jesus seeks us to come to Him. In our second reading we read: “This is my Body, broken for YOU”. But the veils of the world seek to hide Christ. The veils of faith-less human reason, empty tradition and worldly distraction all blind us from knowing His Presence among us. In the Gospel, at the feeding of the multitudes the disciples initially were blinded to Emmanuel, God with them, working in their midst. As they struggled with the impossible needs of the crowd and their insufficient resources they could not see what God was doing. But, they persevered in faith, obeyed in love and soon had abundant reason to know God was working and with them. So it is with us today. It is often much more easy and comfortable to look at the elevated Sacred Host with only our human understanding. Or perhaps we believe He is truly present but it is so much more comfortable to keep Him, if not veiled but at least safe in the Monstrance. But as Pope Francis led us to see on Holy Thursday it is time for Jesus to be unveiled in our Mass, in Adoration and especially in our hearts and lives. 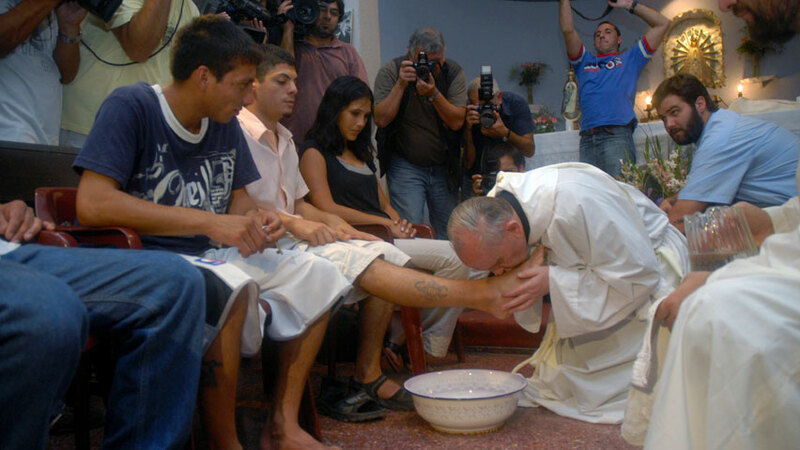 As the Pope washed the feet of those seen as so unworthy he was showing us what the author C.S. 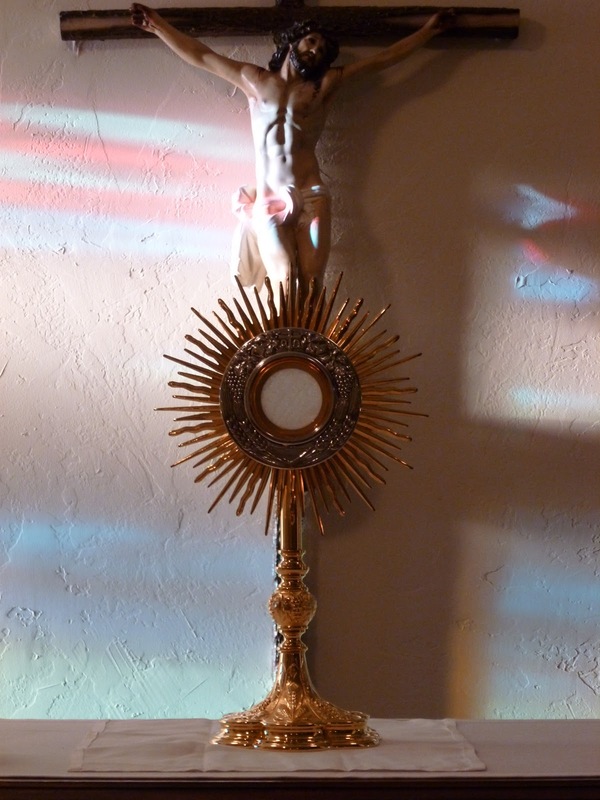 Lewis once wrote: “Next to the Blessed Sacrament itself, your neighbor is the holiest object presented to our senses”. The sacred Body and Blood of Christ consecrated at Mass, the Sacred Host adored in prayerful adoration were never intended by God to be static, isolated places and times. The longing of the spear-pierced Sacred Heart of Jesus is that we receive Him and become what He redeemed us to be living and holy tabernacles for His Presence. It is through the Body and Blood of Christ, as we are healed through His sacred wounds we are freed to become those sons and daughters of God created in His sacred image. It is through the Body and Blood of Christ, removed of worldly veils, that we both see, share and become the Body of Christ He redeemed us to be.